Cost: $85 for a full-day workshop. You also get my Plotting Your Novel Workbook. 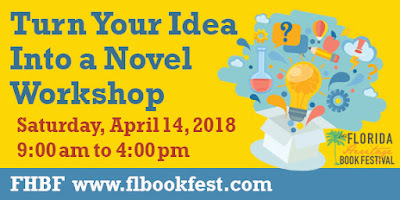 This day-long workshop is hosted by the Florida Heritage Book Festival folks. This hands-on workshop will guide you through the novel-planning process and help you find the plot and story within your idea. By the end of the day, you'll have a solid outline (or guide for those who don't like to outline) to your story.